An element of furniture configured by one sole piece of laminated aluminium served by the industry, to which five cuts are performed, and which is subsequently folded. An economic manufacturing, since it does not require too much handling, unlike other designs with complex assemblies. An economic recycling process as well, since it does not need dismantling; this unitary character grants it a unique value in itself as an aluminium “ingot”. It allows to produce it and have stock with a simple storage before folding them. 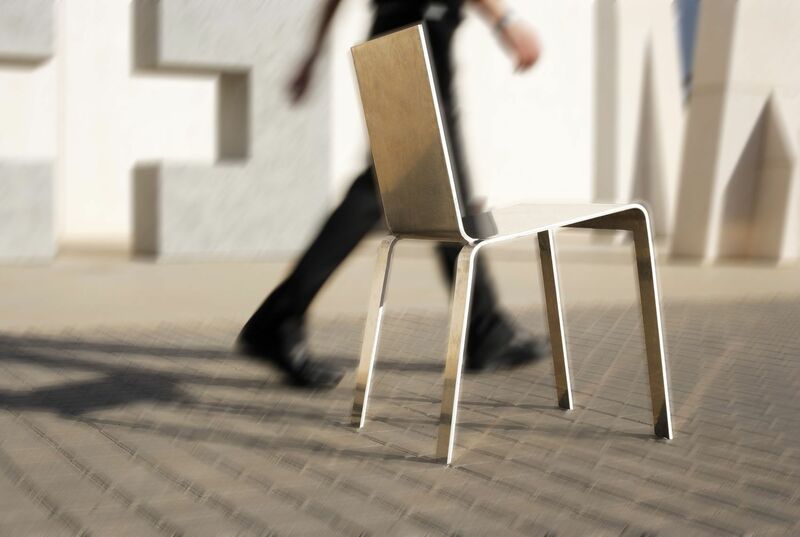 An ergonomy that deals with the functional aspects of the chair, its comfort, the possibility of stacking it, integrating it in a work space as well as a domestic space, using it in the interior and the exterior… Another quality, difficult to summarise, refers to the value of the piece as an object, with the sole purpose of being contemplated.